A most glorious concert full of superb playing by the ACO under the guest leadership of Lorenza Borrani who was very stylish in elegant black culottes. What was interesting to note is that all three works were not originally written for a string orchestra. First we heard PROKOFIEV’s Violin Sonata No.1 in F minor, arranged for violin and strings by Borrani. It was given a powerful, passionate performance. The cellos and basses generally took the piano parts, with the violas acting as the middle of the keyboard, the violins on top. The first movement opened sombrely and sorrowfully and featured an eloquent, almost heartbreaking solo by Borrani. The cellos and double bass rumbled in agreement with Borrani’s anguished statement, the violins then joined the discussion. The music became shimmering and floating yet sharp and spiky. This then changed to a somewhat lighter mood and melody that swirled and pulsated. The second movement had a very energetic opening by the cellos and double bass, with a rather ominous march like tempo. Borrani was fiery and defiant with sharp, spiky flurries. An angry discussion developed between the two sections of the Orchestra with Borrani attempting to be a peacemaker. A relentless driven rhythm took us to the dramatic ending. The third movement featured haunting, wistful delicate violins, Borrani leading the lament and she had a lyrical passionate solo. The final fourth movement opened explosively at a very fast tempo and included blistering pizzicato. Most of it was breathless and tempestuous with a somewhat quieter segment then a return to the insistent flurries as a discussion between the various sections of the Orchestra and Borrrani. Dynamic and driven it ended on a circling, aching cry. 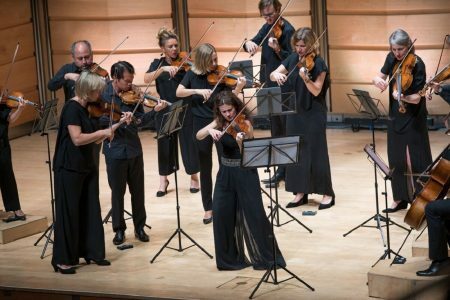 First after interval came the Australian premiere performance of Dobrinka Tabakova’s Such Different Paths written originally for Dutch violinist Janine Jansen with a bright, sunny opening. The violins stated the melody, then the cellos and double basses answered and discussed in an animated circular conversation. The cellos interrupted with a slower, stately melody which was taken up by the violins. This then changed to a whirling dancelike melody leading to a surging group deliberation that became rich flowing and textured before closing with shimmering violins. Then we heard BEETHOVEN ’s last String Quartet, Op.135, written only a few months before his death. It opened briskly yet thoughtfully .The second movement began with a leaping , jumping feel and the full Orchestral ensemble became agitated and swelling. The third rather slow movement was rich heartfelt and reflective. This was in contrast to the final movement with its sharp , spiky sound and bustling ensemble leading to darting, skimming use of pizzicato before the flourishes at the conclusion. The encore Pantomime Movement V by Alfred Schnitkke was given a darting, pulsating performance. 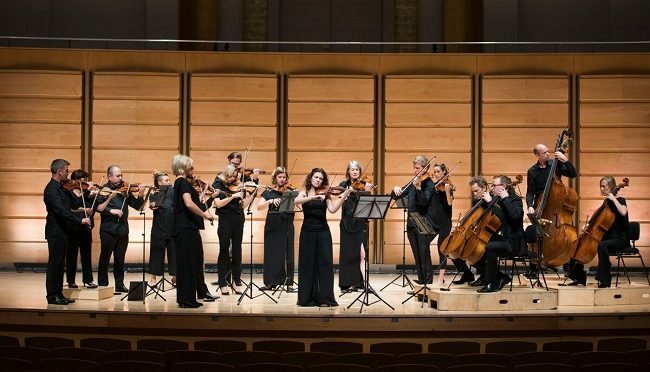 The Australian Chamber Orchestra in Beethoven and Prokofiev is touring nationally until the 19th March, 2019.